I realize that there is already one egg sandwich with tomato jam in the archives of this site, but I can’t resist sharing my current favorite incarnation. It starts with a pat of butter melted in a very well seasoned cast iron skillet. I bought this square one on eBay many years ago and it’s one of my very favorite pieces of cookware. Once the butter is just melted, I pour in two beaten eggs and tilt the pan to get an even coating. 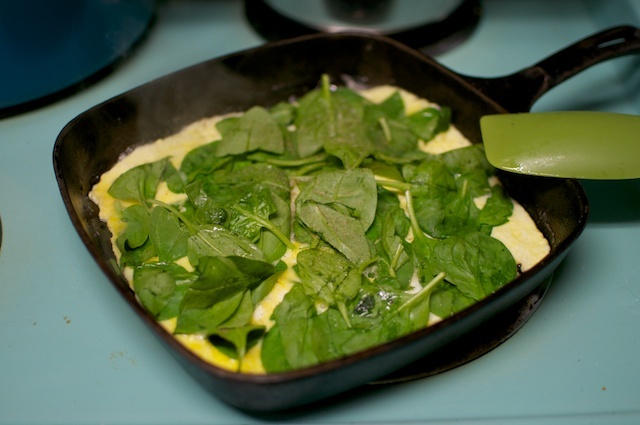 While the eggs cook, I line the top of the eggs with spinach leaves. You want to get them in there while the eggs are still quite loose, as then they cook into the eggs and will stay in place when you flip. 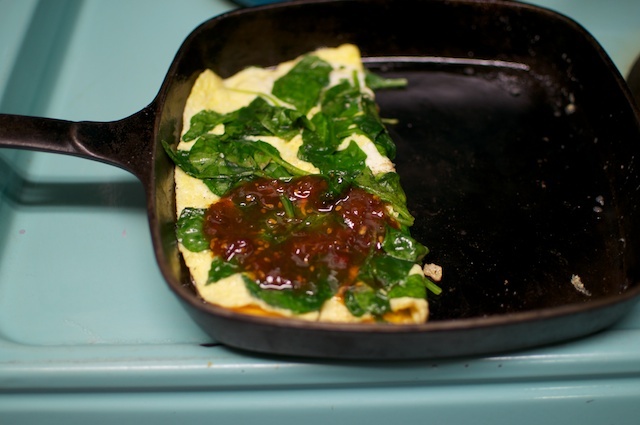 Then you ease a spatula under the eggs (taking care to work all around so that you know nothing is sticking) and flip. This takes some practice, but as long as the skillet is well seasoned and you used butter (coconut oil also works), you should be able to do it. Once the eggs are flipped, I turn off the burner and let the residual heat in the pan do the rest of the cooking. This is also the point at which you add some cheese. Cheddar is nice, but dill havarti or creamy goat cheese are also favorites. I make one fold and add a goodly dollop of tomato jam. Another good option is a caramelized onion jam (there’s a recipe I like a lot in Preserving by the Pint). Fold again and place between two slices of toasted bread. You can also roll it up into a tortilla if you’re feeling more like a wrap than a sandwich. Then, you wait until the sandwich cools ever so slightly (molten hot cheese burns are no good) and then you dig in. The sandwich makes enough that you could cut it in half and share it with a friend if you’re feeling generous. That looks pretty good. I learned this summer, to saute asparagus, or zucchini or other greens with a little onion and add the eggs, cooking until they were just done, then add a grind of fresh black pepper and grated parm, all in an effort to embrace the fresh veggies. That bread looks divine. The jam pushes it into the sublime! This is actually my favorite thing to do with tomato jam. 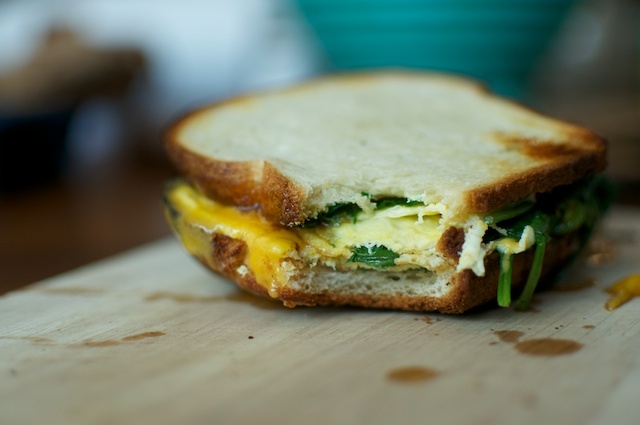 Egg sandwich with spinach and cheese. Yum! My next project to try with our home grown tomatoes, yum! That looks mighty good, in fact @ 4am it looks really darn good. That would be nice to have with my coffee right about now. Yowza, that sounds soooo good! And now my stomach is rumbling. I need this in my life! I made your tomato jam this year precisely for egg sandwiches! And the jam is GREAT. This incarnation looks delicious. I also want to find other ideas for tomato jam – I think my best friend used some kind of tomato chutney with her grilled cheese sandwiches one year. But surely there’s a use beyond sandwiches? Hi Marisa, I have your book, Food in Jars, and have been looking through it. Right now I have a ton of basil and I’m looking to preserve it — in a jar, because our freezer is a little small. I was wondering if your recipe for rosemary salt could be adapted? Or are there any other suggestions you could give me on this? It would be much appreciated. I’m so new at this! After reading this post, I looked up the recipe and made some with Roma tomatoes from the garden. WOW!!! 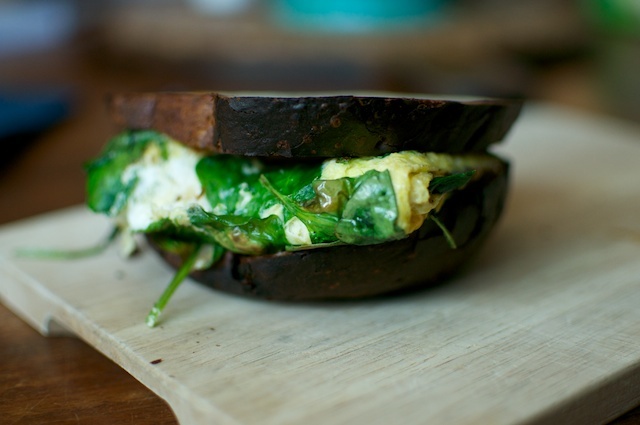 This sandwich makes me want a square pan, yum! I might be making this for dinner tonight in a round pan with corn on the cob on the side (instead of bread). Nom. Whoa that looks delicious! 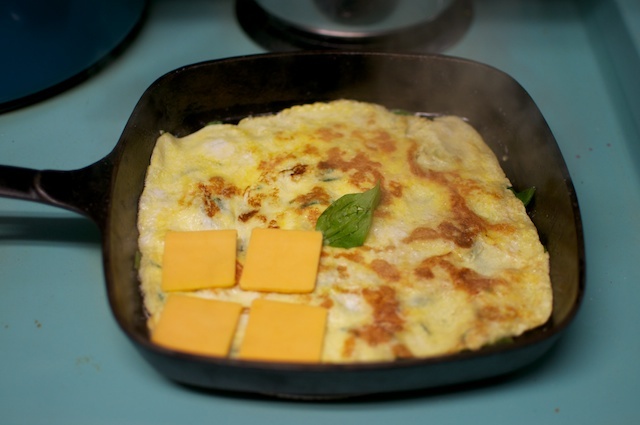 I totally want a square pan now just to try this.